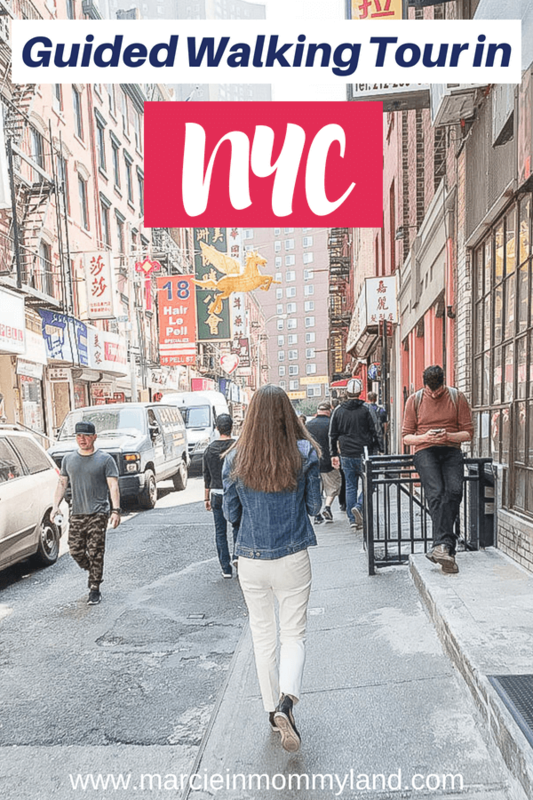 When I started planning our kid-free trip to New York City earlier this year, I got a bit overwhelmed. 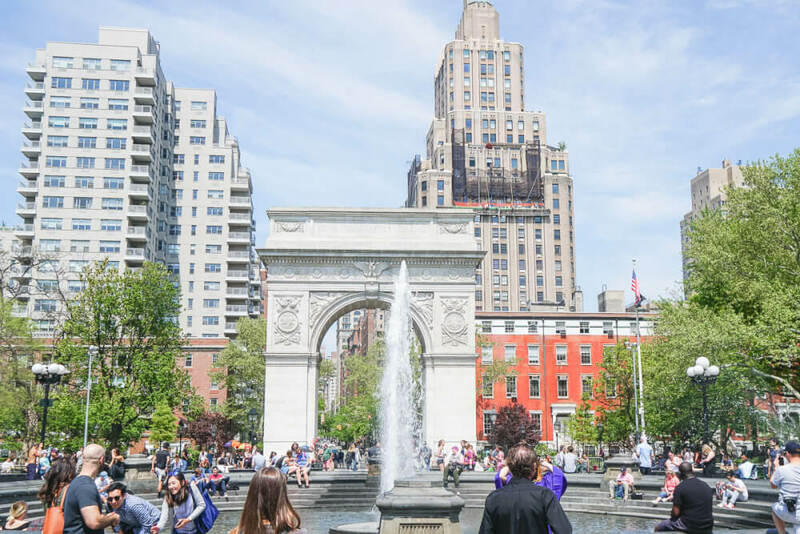 I love planning our trips, but there are so many places to explore and things to do in New York City. I was worried we wouldn’t have time to see even half of what was on my list. So, I started researching guided tours of New York City. 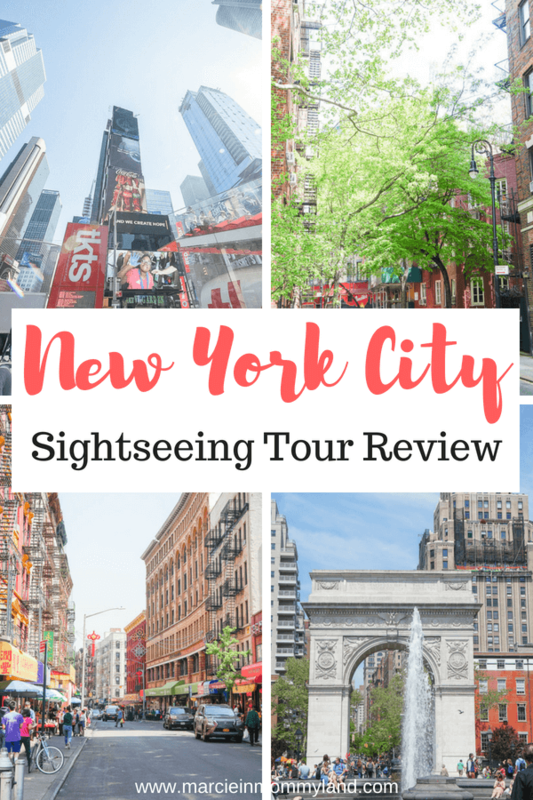 I checked TripAdvisor, Google, and asked for the best New York City sightseeing tour in my Facebook groups. Real New York Tours is the name that kept popping up. Launched in 2007, Real New York Tours is run by native New Yorker Luke and his wife, Amber. Both of them are passionate about sharing their vibrant city with people from all over the world. Their goal is to offer guests an immersive tour experience. And they want to disprove the belief that all New Yorkers are rude. They are a small family business with a select number of tour guides that also want to connect with people visiting their amazing city. 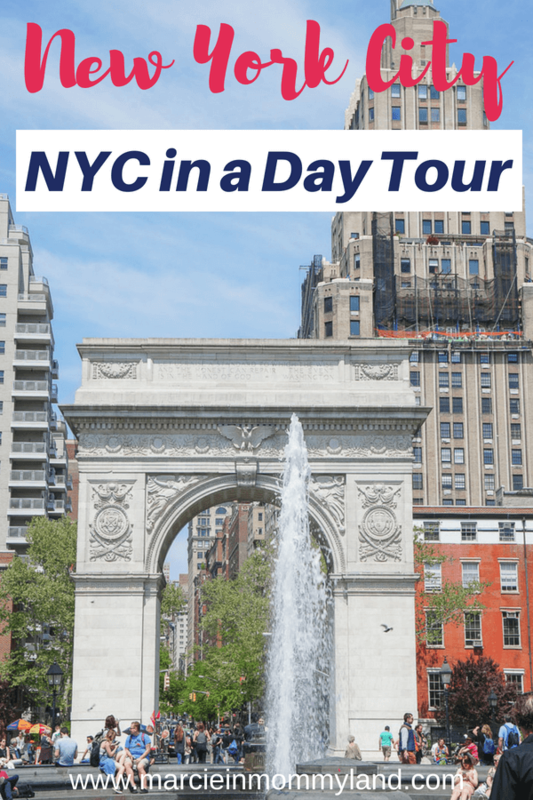 The tour that seemed like the best sightseeing tour for our first trip to New York City was this NYC in a Day Group Tour. It was 6.5 hours long and hit up all the main tourist attractions in Manhattan. 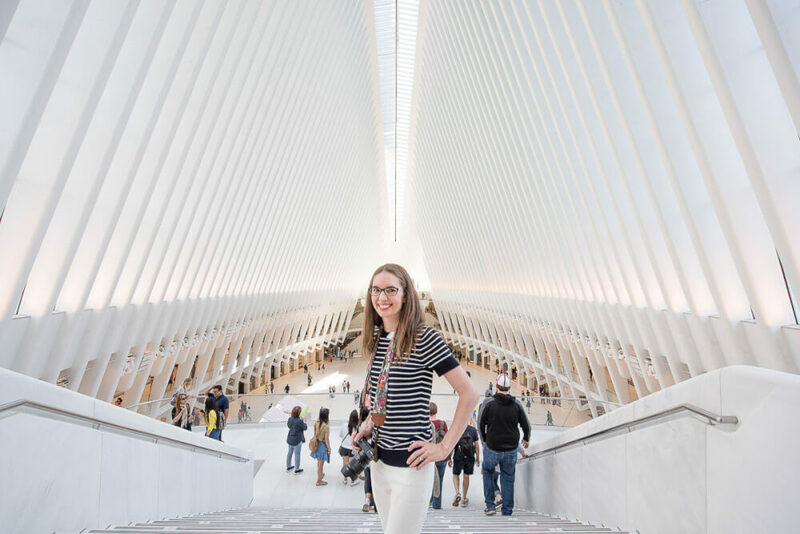 The itinerary included: Times Square, Central Park, Greenwich Village, Soho, Chinatown, Little Italy, Wall Street, and the World Trade Center site. It started at 10am, so we’d have time to get coffee and get over jetlag. We could practice using the subway with a local. It covered many Manhattan tourist attractions much faster than we could on our own. It’s a small business run by a family with 2 little kids. While 6.5 hours seems like a long tour, it went by in a flash. Part of the reason is that we walked quickly and hopped in and out of subway stations. We covered a lot of ground, asked a lot of questions, and were totally immersed in the magic of New York City! We met at Paramount Plaza where our tour guide Trey checked us all in and made sure we were paid up. 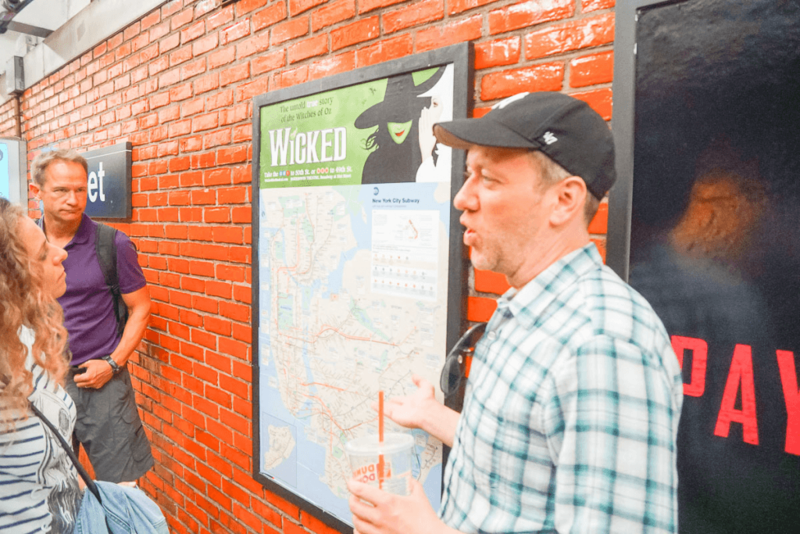 He came to NYC to become an actor and has been with Real New York Tours for years and years. 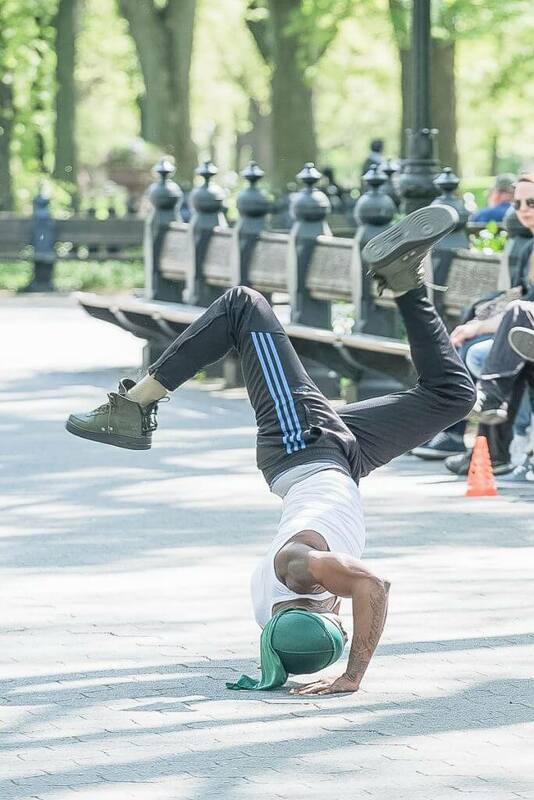 He was originally from Alabama, but New York City is definitely his home. He walked us over to a spot in Times Square right next to the TKTS booth. That’s where you can get discounted Broadway tickets. We wanted to know where that was, so it was pretty cool that was our first stop. Trey talked about how Times Square used to be a shady part of town until the city encouraged family friendly businesses like M&Ms, Toys R Us, McDonald’s, etc to come there. 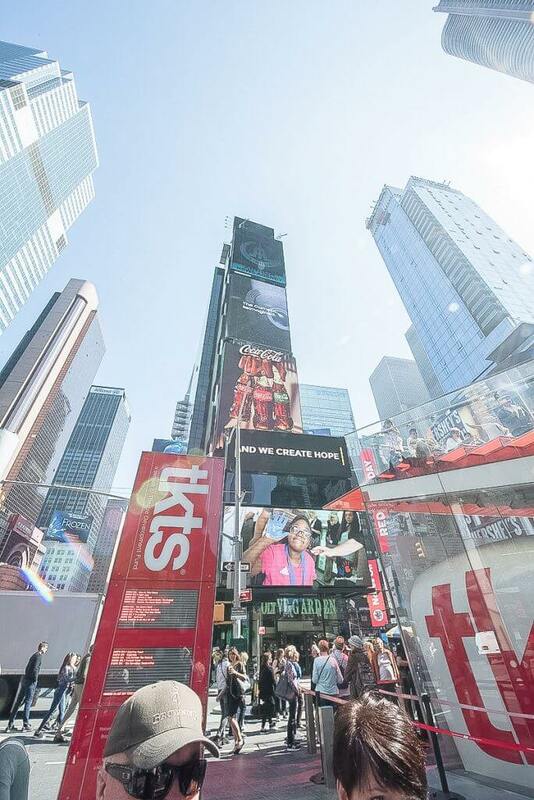 Now, it’s one of New York City’s top tourist attractions. We got a quick overview of the area and then headed out of there as quickly as possible. Personally, I was glad to get out of there! We all headed down to the subway and Trey made sure we all had metro cards. Most of us did, but he helped the rest figure out which pass to buy. Then, he explained how the NYC subway system worked and answered our questions. Trey did a great job of telling us which stop we were getting off at. And while we were on the subway, he made sure he had eye contact with everyone. In all the years he’s been providing tours of NYC, he hasn’t lost a single guest. And with how quickly this tour moves, that’s pretty impressive. We were very excited to explore Soho. That’s where our hotel was located, but we hadn’t had time to walk anywhere except the subway station. We had always heard it was a “cool” area, but we weren’t sure exactly why. 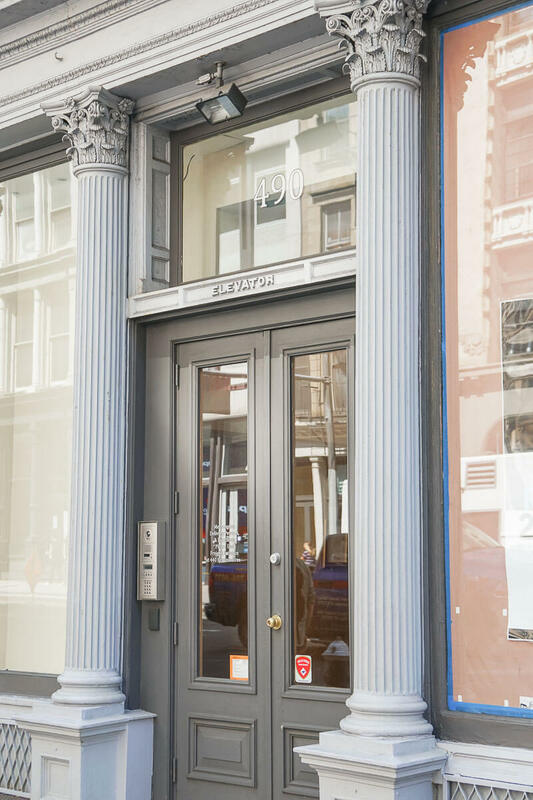 Soho is a neighborhood filled with details you’d probably overlook if they weren’t pointed out to you. For instance, most of the facades are made up metal that has been painted to look like stone. We stopped at the world’s first modern elevator. It’s a doorway we easily would have walked passed without giving it a second thought. We also stopped for a moment to talk about fire escapes. 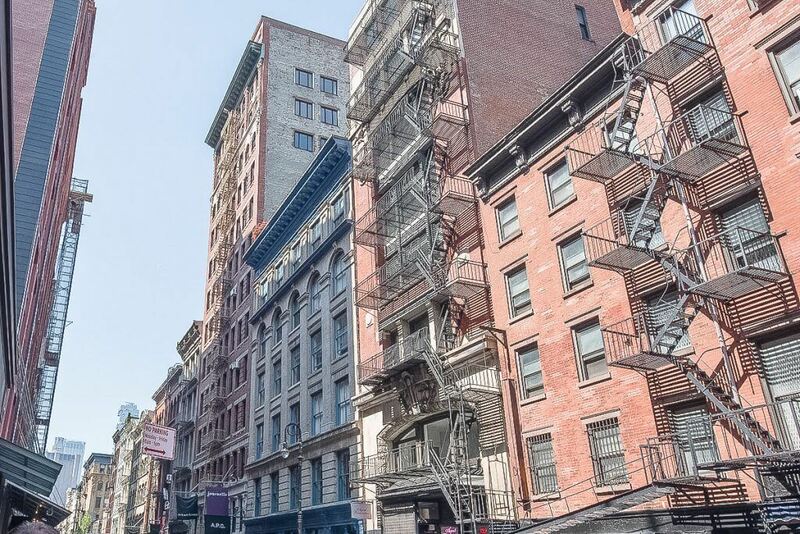 When you see a fire escape, you immediately thing of New York City. Trey told us that he had a guest from another country ask what it was. He explained the history of New York City’s overpopulation during the industrial revolution and how the fire escapes were put in give families a fighting chance of escaping in case of a fire. That’s when I realized just how iconic fire escapes are. I mean, they’ve been so ingrained with most movies, TV shows or Broadway shows set in New York City. It was nice to take a moment to really look at them. Another area I was interested to see was Little Italy. I’d been to North Beach, San Francisco’s Little Italy many years ago. But, I’d heard so much about Little Italy in New York City from movies and TV that I just had to see it for myself. Being hobby genealogist, I had to take a moment to think about the people who lived here when it was truly bustling. I imagined people speaking Italian as they shopped for groceries, kids playing in the streets and the smell of food in the air. 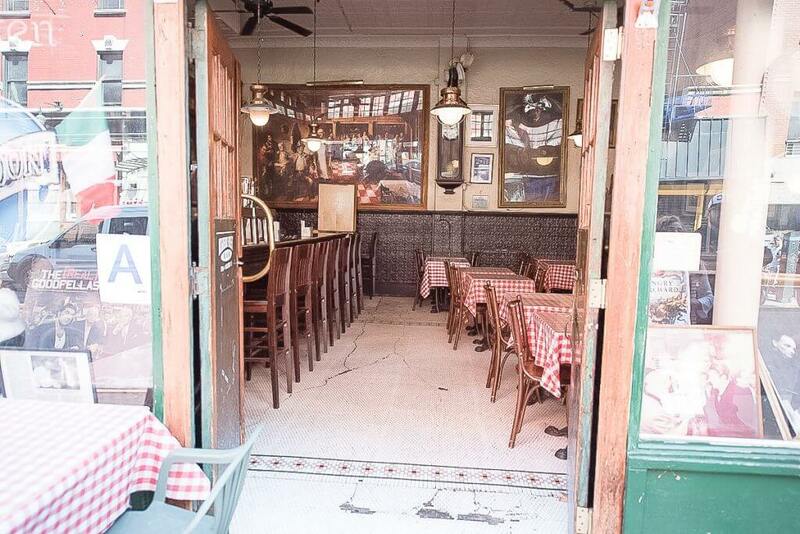 While times have changed a bit for Little Italy, the smell of delicious food still fills the entire neighborhood! While it was a bit too early for lunch and we just didn’t have enough time to sit down to eat, I’m glad we got to peak inside a few Italian restaurants. I may have geeked out a bit when we came across Mulberry Street Bar. It was the filming location for The Sopranos and many mob movies. 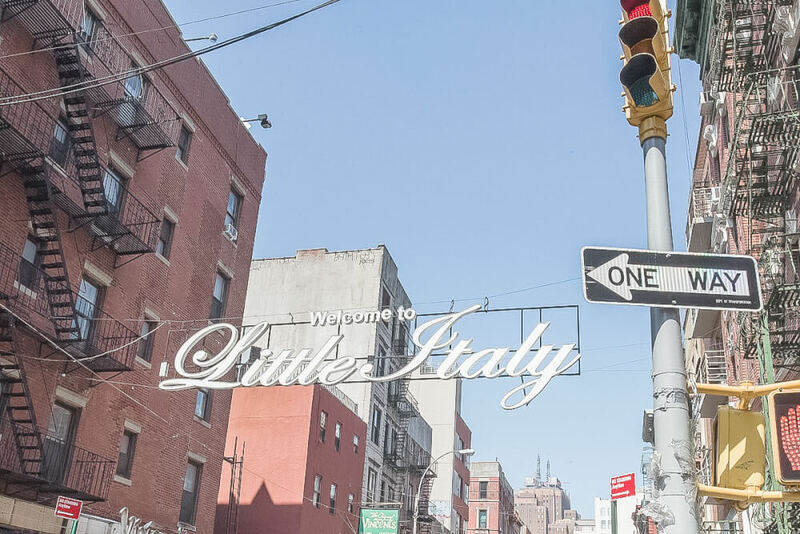 Trey told us that Little Italy used to be huge, but now only takes up 3 city blocks. It’s quickly being absorbed by Chinatown. And there’s no transition between Little Italy and Chinatown. It’s literally cannolis on one corner and roast duck on another. Being Chinese and visiting Chinatowns all over the world, my husband was pretty curious about seeing New York City’s Chinatown. His dad actually lived in NYC Chinatown briefly in college. 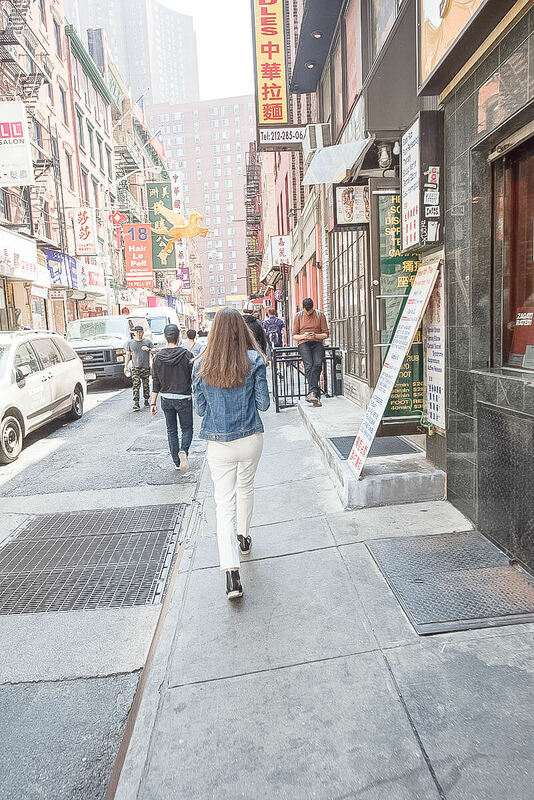 As we cross the street from Little Italy, it felt like we had traveled across the globe. As we walked around, it reminded me of the first time I went to Hong Kong. The side streets were winding and it almost felt like a movie set. That’s no surprise, as many movies and TV shows have been filmed there. But, you could just feel the history pouring out of the buildings and streets. My husband heard Cantonese as soon as we entered Chinatown, but as we got closer to the edge of this neighborhood, people started speaking Mandarin. It was an interesting observation to us. Being from the West Coast, most of our Chinese restaurants are Cantonese. But, we’ve been hearing more and more Mandarin with new businesses. 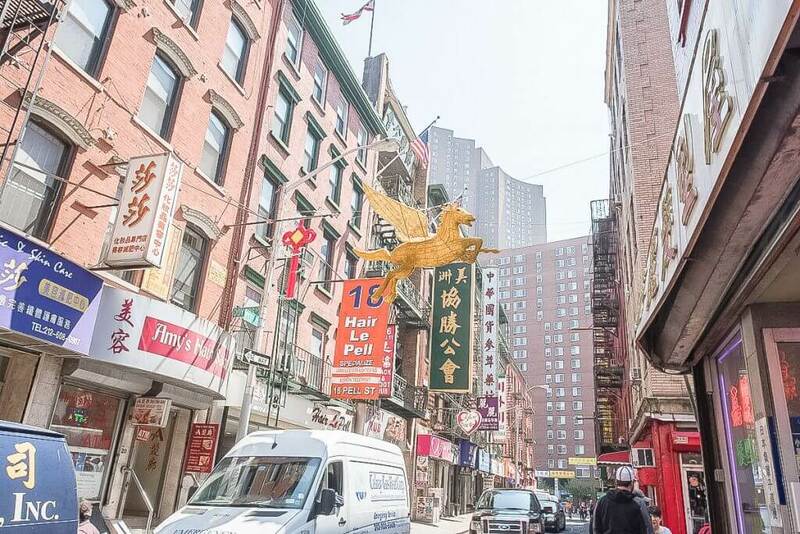 We could have spent a few hours walking around Chinatown in New York City. Trey pointed out a foot massage place that sounded perfect for our aching feet. And I would have liked to stop in at a few of the Chinese bakeries to sample their treats. But, the point of this tour is to keep moving and see as much as we can, so we soldiered on! I didn’t know much about Wall Street, except from TV shows. I envisioned really tall buildings with people in business suits walking around quickly talking on their cell phones. That wasn’t exactly the case. I mean, who talks on their phone anymore? 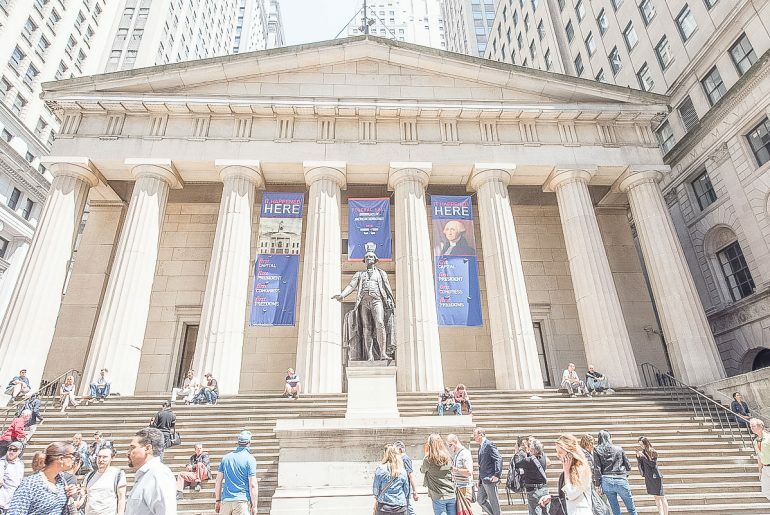 Actually Wall Street is filled with some of the most beautiful architecture. And there’s a bit of artwork, which is nice. But, contrary to belief, the famous statue of the bull is not located on Wall Street. It’s a few blocks away and no, we didn’t see it. The first stop was the New York Stock Exchange. 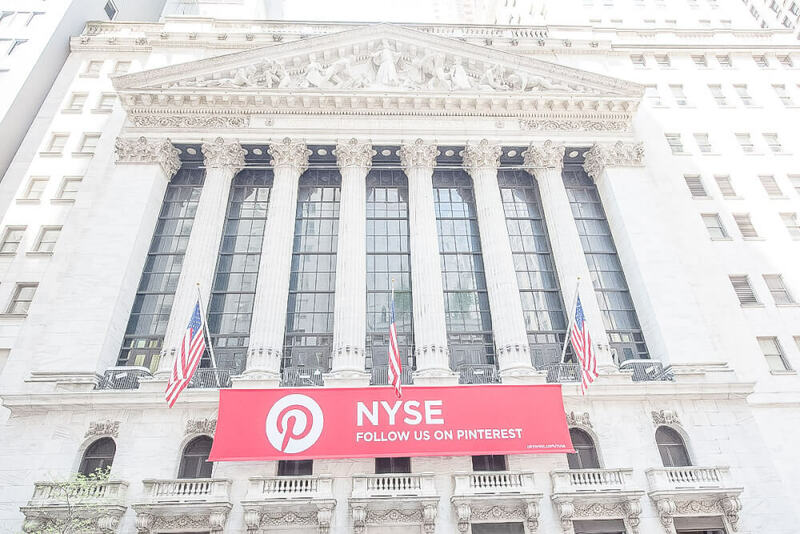 Trey probably said some really important stuff about it, but I couldn’t get over that hanging from this incredibly ornate building was a massive banner asking people to follow them on Pinterest! I had just been to the Women in Travel Summit where I was in a session about how to use Pinterest strategically. As a family travel blogger, I spend many hours on Pinterest researching my trips and getting my content out there. So, I thought it was funny that even the NYSE realizes the power of Pinterest! My husband is a HUGE Hamilton fan and he was pretty giddy seeing Trinity Church, where Hamilton is buried. 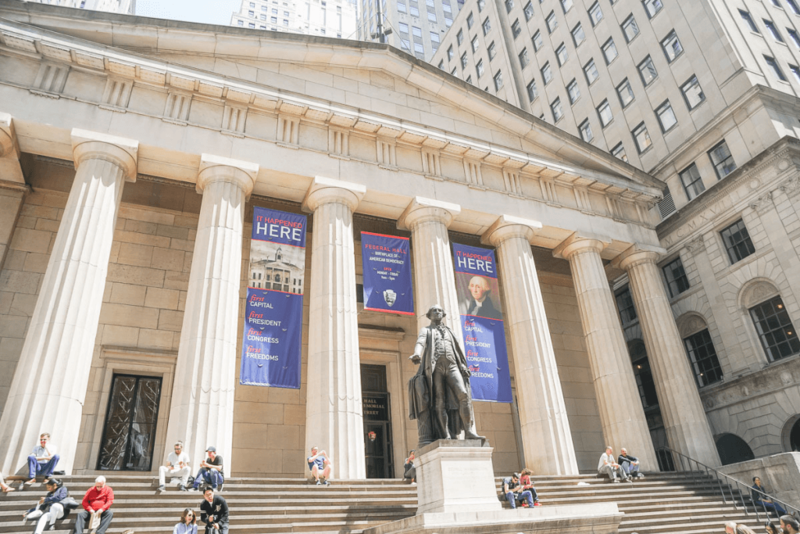 Thankfully, we had just seen Hamilton when it came to Seattle or I wouldn’t have realized just how much American government started in New York City. The Federal Building was another top thing to see in New York City. We stood at the bottom of the stairs while Trey talked to us about the history of Wall Street. Apparently there used to be a real wall there, hence the name Wall Street. But, I couldn’t stop looking up at the Federal Building. To see the statue of George Washington in front of such an important place in American history was truly awe-inspiring. In a completely different way, the World Trade Center site also was a powerful place to visit. In all frankness, I wasn’t sure I wanted to visit. I’m not someone that likes to visit memorials or hear about atrocities. You won’t find me touring these places on vacation. So, I was a bit torn about stopping at the World Trade Center site. We stopped briefly at one of the memorial areas. They have created massive fountains that take up the footprint of each tower. 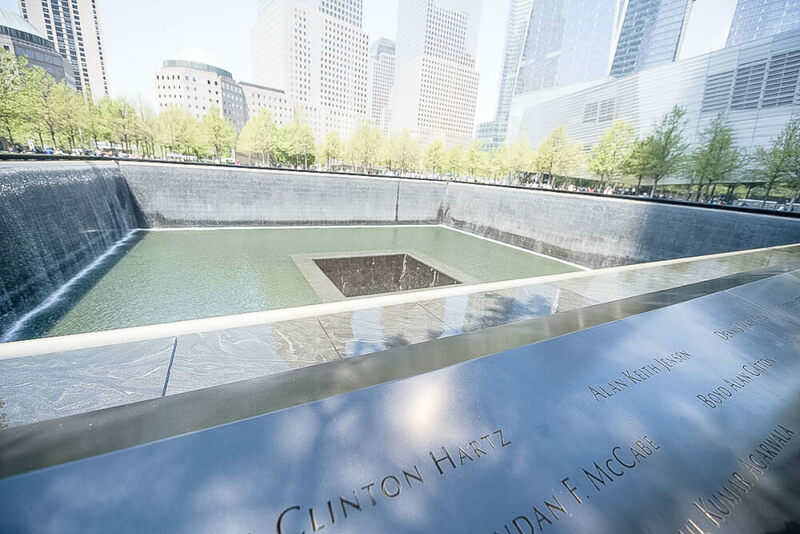 Along the fountain are the names of the people who died in the 9/11 attacks. Trey told us that the names aren’t alphabetical, but grouped so that co-workers are listed with the people that sat next to and worked with on a day to day basis. And white flowers are placed by their names on their birthdays. I thought both of those were really thoughtful touches. If you look up from the World Trade Center site, you’ll see One World Trade Center aka Freedom Tower. It’s the tallest building in New York City for symbolic reasons. You can buy tickets and go to the observation deck at the top. We didn’t have time to go up during this trip, but I know my husband really wants to do that in a future trip to NYC. We walked up to a huge white building and Trey asked us if we knew what it was. No one had any idea. It turns out it’s a train station that also has high end shopping inside. It’s fairly new and it’s a very bright place. But, don’t be fooled, it’s not as awesome as it sounds. Then he shows us places where the building is still unfinished. He goes on to show us places where the marble is already stained due to spilled drinks and how the marble is so slippery with wet shoes that they had to scuff it all up for safety. The real kicker is when he shows us how the old part of the station (from the 1970s) has ramps, but the new part only has stairs. There’s a spot where the ramp ends and it’s just stairs. As a Mom who travels with a stroller, I can imagine how frustrating that would be. It’s so strange that no one realized (or has remedied) this major oversight. We took to subway to Greenwich Village for lunch. Trey took us to a spot where we could get pizza, sandwiches, bagels, bakery items, and more. My husband and I decided to grab a slice of pizza and go sit in the park. We looked around and it was really cool to see people from all walks of life also eating their lunch at this park. We still had a bit of time before we needed to meet up with the group, so we grabbed sorbet from Grub. It was super tasty and just the sugar boost we needed to keep walking! When I was younger, I really wanted to go to NYU. I remember stalking their website and seeing the Washington Park Arch. It looked like such a cool place to go to college. But, Sept. 11th happened during my junior year of high school and NYC didn’t seem in the cards anymore. However, I was thrilled to get to walk through this park and see people taking their graduation photos! We also walked passed the building that was featured as the apartment in Friends. I only had time to snap a pic on my phone to send to my friend, who is a huge Friends fan! See, this building is situated between Aaron Burr’s house (you know, the guy who shot Hamilton) and a famous writer. This entire street is filled with historic homes. 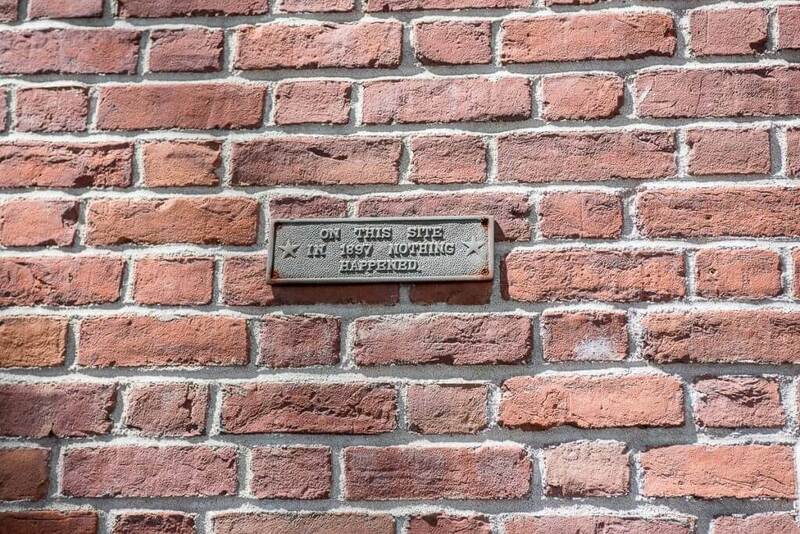 Most of them have plaques out front stating who lived there and why it’s significant. Trey told us that the owner of this home got fed up with people stopping to take photos of everyone’s house on his street that he put up this sign. Who knows if that’s actually true, but apparently similar signs have been spotted all over NYC. We love little details like this! This NYC in a Day tour ended in Central Park. At that point, I believe it was around 4pm, so ending at Central Park was pretty brilliant. 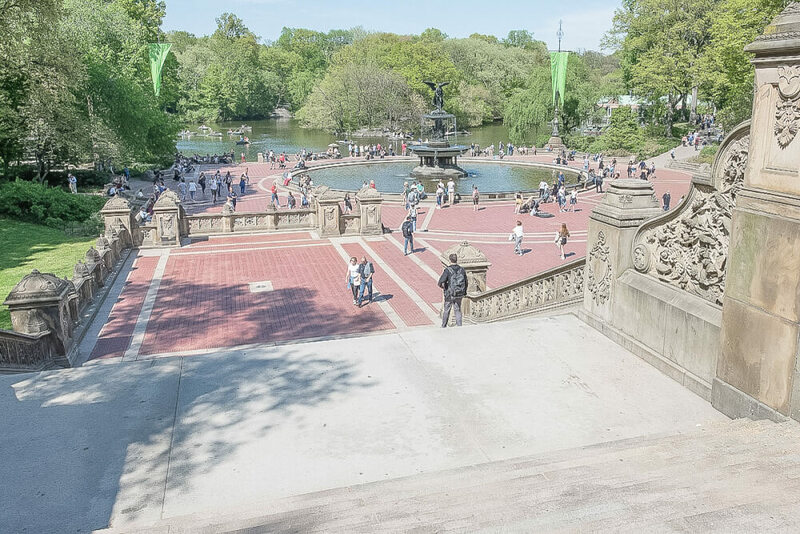 People could spend as much time as they’d like exploring the park on their own time. We walked right past the doorway where John Lennon died before heading into the park. 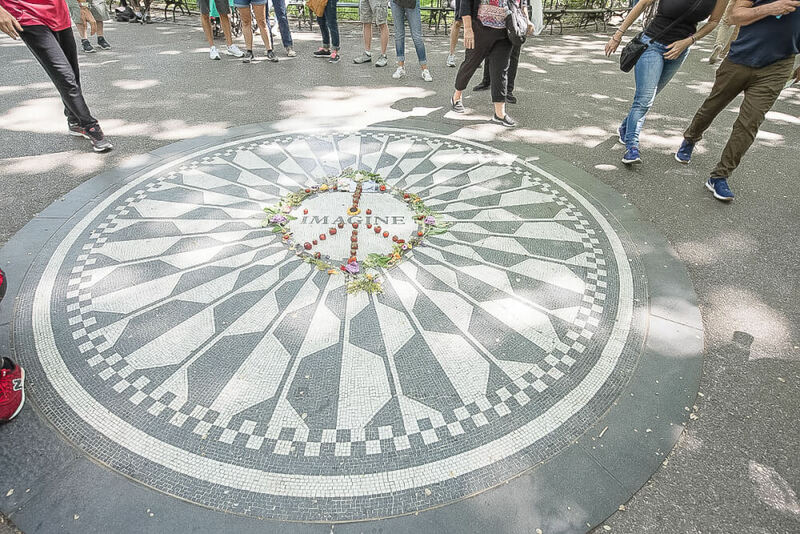 The first thing we saw was a memorial for John Lennon in the Strawberry Fields section of the park. It’s supposed to be a quiet area for reflection, but someone was singing loudly and playing the guitar. With all the people gathered around to see this, I wouldn’t imagine it being a very quiet spot most of the day. One of my favorite scenes from a Disney movie is when Amy Adams is dancing around this fountain signing “That’s How You Know” in Disney’s Enchanted. Part of the scene is Patrick Dempsey wondering how everyone suddenly knows the lyrics to this song as they join in. My husband and I quote this all the time, so we both thought it was pretty cool to see this Central Park photo spot. Something else that was cool was seeing people just enjoying the park. We saw people break dancing, playing music, painting, strolling on a romantic walk, pushing strollers, etc. It’s a “working” park and people use it like they would any park in the U.S. The tour ended as we exited Central Park. We later looked at a map to see how much of the park we covered and realized we basically just walked across a tiny section of the park. And we walked quite a bit, so it just goes to show how incredibly huge Central Park is! At the very end of the tour, Trey asked each of us where we were headed. Then, he gave personalized directions to make sure everyone knew where they were going. He gave us a few tips about where to eat, which was helpful. Perfect for adults: We specifically picked this tour because it’s ambitious. However, if we were coming with our little kids, we probably wouldn’t pick it. It would be cumbersome to do with a stroller and there aren’t a lot of bathroom breaks. But, if you have a baby, it would be easy to do with a baby carrier and a backpack. Do it at the beginning of your trip: It would be perfect for someone’s first day in NYC because you learn the subway system and get a feel for Manhattan. It’s fast-paced: This tour moves very quickly and there’s not much time to take photos or really look around. So, if you are hoping to have time to leisurely explore, this isn’t the tour for you. But, if you want to get an overview of Manhattan and see as much as possible, this is the right tour! 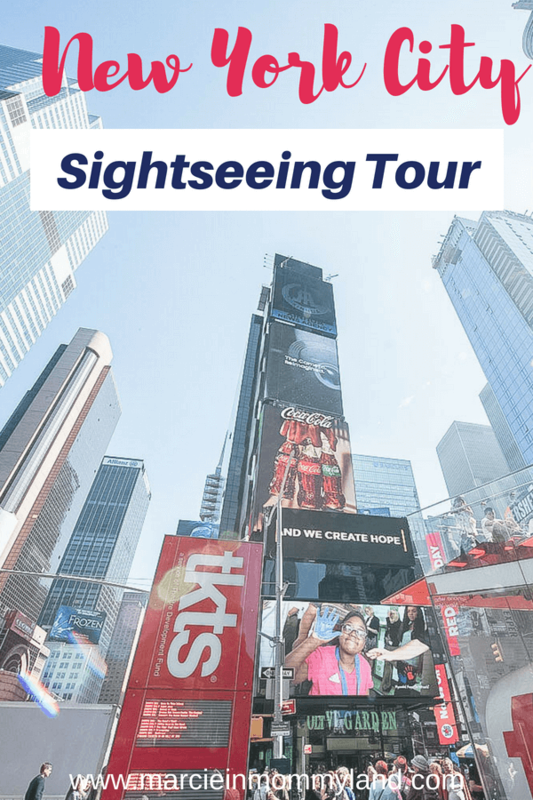 Great tour length: For a New York City sightseeing tour, 6.5 hours is enough to see a lot of the city without being exhausted. I appreciated that this tour ended at 4:30pm, because we still had time to explore the city on our own. And we had plenty of time to eat something, head back to our hotel to rest, and then go to a Broadway show. Real New York Tours provided me media passes to review this NYC in a Day tour. All opinions are my own. I bet it will be a whole new experience when you go back as an adult! Wow, you covered a lot of ground! I love the idea of riding the subway with a local, lol. The last time I was in New York, I had to find my way back to Manhattan from Brooklyn via subway, and I was terrified. It worked out, but I was so nervous! Yes, it’s definitely a stress-free way to ride the subway! I feel so lucky I only live an hour commuter train ride to NYC from Philadelphia – so I can even go for the day. I’m taking my niece & nephew to see Frozen on Broadway next week! The only place I haven’t been to multiple times on your list is the Oculus & it sounds like I’m not missing anything! I know, right? Apparently, they are popping up all over NYC! Would make a fun scavenger hunt! What a great post! I’m headed to NYC for the first time in the fall, so I’ll definitely pin this for later. I want to spend a whole day in Chinatown! I loved the one in San Francisco. Oh, NYC in the fall will be gorgeous with the leaves changing! We love the one in SF, too! This one is less hilly! This is such a wonderful guide. I have never been to New York as I am from India. But your list is tempting me to visit the city. It’s such a vibrant and incredible city! And we met a lot of really nice people, contrary to popular belief! I live n Manhattan, and honestly love doing a city tour when friends come to visit! I bet you are always discovering new things about your city! I’ve been to NYC three times now and still have not made it to several of these locations. What a great way to experience the city! There’s just SO MUCH to see in NYC! I am definitely doing this the next time we visit NYC. I have family in NYC, so we visit there often and often leave our kids with my sister while we hang out in the city. Dropping your kids off is an AMAZING perk! Love the little sign! All the spots look amazing! We still crack up about that sign! Oh I hope you are inspired to go! I’ve heard the city has changed a lot! Haha! I’m glad I’m not the only one! Yes, it’s always best for us to get our bearings first before exploring on our own! I haven’t been to NYC in about 20 years!!! 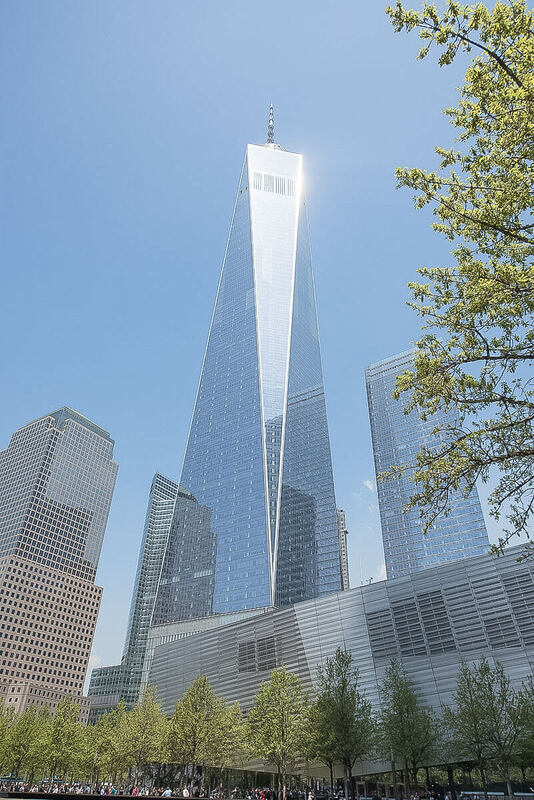 I, like you, wouldn’t be sure about visiting the site of the World trade centre, but I think the way they have ‘developed’ it and remembering those who died, is a really beautiful way to deal with tragedy. Yes, they did a really respectful job!